Description: Sixteen year old Jade is content living in Nirvana dealing with her feelings for her best friend Ty and trying to decide which parent's life path she wants to follow. That is until her Grandmother Ruby dies and leaves Jade a diary containing secrets she wishes she didn't know. Now Jade is faced with a crushing decision - Go and leave everyone she's ever known and risk exile and blindness or stay and live a lie. Why I Picked This Book:I'm trying to read more outside my standard genres and I liked the mystery mixed with the SciFi. Plus I had enjoyed a short story collection (In Death) by this author. Pro: I liked how Gillespie fleshed out Nirvana. I really could visualize what the compound looked like. It's well drawn with just enough characters to really bring it to life but not so many that it's impossible to keep them straight. The rules of Nirvana were interesting and laid out nicely. I found the whole issue with children and life paths interesting and gave a real reason for Jade to feel torn. When Jade is faced with a very serious life and death decision I thought she behaved very realistically - at times wishing she didn't know what was really going on. There's some interesting twists and turns and I definitely wanted to keep reading to see where the story was going. 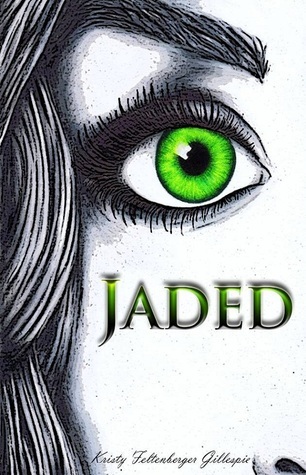 Jade is a sympathetic and interesting character as are her parents, Peaches and Ty. Con: I got a bit impatient during the last 1/3 of the book. While I appreciated how difficult the decision was I wanted steps to start being taken one way or the other. This led to a little too much dialogue with friends and family as well as internally. Overall: This was an interesting read and while not quite my usual reading I still enjoyed it. This is definitely the first book in the series. While the ending wasn't necessarily a cliffhanger we're left with a lot of questions. Would I Read More of this Series/Author? : Yes, while not my favorite genre, I'm curious to see what happens with Jade and her friends and family. Would I Recommend this Book? : Yes, especially if you enjoy YA and dystopian-type books. Katherine, I've done the same thing you are doing - traveled outside my usual genre to try YA and yes, even (gasp) romance. It's been interesting reading. Harder for me to do a review, but challenges are the spice of life. I always like your reviews. Thanks! I enjoyed this one though it was a bit out of the norm for me. It keeps me from getting into the dreaded reading rut. Thanks so much for your review, Katherine! You rock! I enjoyed this one! Can't wait to see what happens next! Yes, for stepping outside your bubble! I know how comfortable it is in there, but getting out can offer so much amazingness. :D Lol! I'm a sci-fi girl. Although 2014 was really lacking in it. I'll have to add this one to my Goodreads. It sounds quite intriguing. I actually thought of you after I read it. I enjoyed this one and may have to read outside my bubble more often! Despite the muddles last 1/3 I am loving the sound of the world building and plot concept. So glad you tried something new. I'm looking forward to seeing what happens next in the story! Sounds good, although really not my genre. It was outside my genre too but I was feeling dangerously close to a reading rut! This sounds really interesting, Katherine. I haven't heard of this book before. I do like dystopian-type fiction on occasion, most of which I've read has been YA. YA is hit and miss with me though, so I'm picky about the books I read in the genre. I will have to look for this one since you recommend it. I found this interesting but if be curious to know what someone who regularly reads the genre thanks. Love your review! This book sounds pretty interesting...I might have to check it out! Thank you! I enjoyed this one!